Sunday, May 25, dawn. 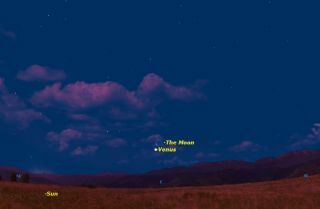 The slender crescent moon will rise just above the planet Venus, shortly before sunrise. Later in the day, you can use the moon to spot Venus in the daytime sky. Early risers are in for a treat early Sunday morning (May 25), when the two brightest objects in the night sky will approach each other to make for a lovely celestial scene. Looking low toward the east beginning at around 4:30 a.m. local daylight time, you'll see a narrow waning crescent moon, just 12 percent illuminated. Situated about 2 degrees below and to its left will be the brilliant planet Venus. Keep in mind that when you’re looking at the moon, it lies some 236,000 miles (380,000 kilometers) from Earth. Meanwhile, Venus is much farther away — 107.6 million miles (173.2 million km). Here's a question you might want to ponder early Sunday as you gaze at the duo: Which is the brighter of the two? At first glance you might think it is Venus, which gleams with a sharp and steady silvery light. In fact, in very dark locations, this beacon of the night can cast a distinct, albeit faint, shadow. At magnitude -4.0, Venus currently shines 11 times more brilliantly than Sirius, the brightest star in the night sky. But Venus still doesn't outshine the slender sliver of a moon, which is just 3 1/2 days from its new phase. In fact, the moon is 30 times brighter than Venus. Venus may appear brighter because all of its light is condensed into a dot on the sky, whereas the light of the moon is spread out over a much larger area. Keep your eyes on the moon and Venus as the sky lightens up. After sunrise, the moon will still be easily visible. And using the moon as your benchmark, you should have no problem in seeing Venus as well; the planet will appear as a tiny white speck against the blue daytime sky. See how long you can follow them through the course of the day. Editor's Note: If you capture an amazing photo of the moon, Venus, or any other night sky view that you'd like to share for a possible story or image gallery, please contact managing editor Tariq Malik at spacephotos@space.com.